The Fax Server pricing is based on the number of workstations that it will support on your network. The "per workstation" price is $49.99 for each workstation on your network that needs fax capability via the fax server. This is the license cost of the standard edition of the desktop/client version of snappy fax. 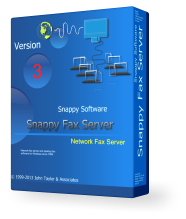 Note that the SG3 edition of the desktop/client software is never needed in fax server/client environment since the only difference in SG3 and standard editions are the ability to transmit/receive at higher class 2.1 fax speeds. The desktop/client software never transmits or receives in this environment so its use is never warranted. If you only need to receive faxes then you may not need workstation licenses, so the base price is your total cost for the fax server which will enable you to receive faxes over multiple phone lines. Unlike our competitors, we do not charge extra to support additional phone lines/modems. Note: the "per workstation" charge is exactly that per workstation. You can install the client software into as many user accounts as needed on a workstation computer without requiring additional licensing. Note: You are not bound by the number of workstation licenses (client pkgs) you purchase with your initial order. To increase the supported number of workstations in the future, you only need to purchase the number of additional client pkgs needed @ $49.99 each. You will receive a new registration key for the fax server to enable support for the additional clients and registration keys for the newly added workstations.